It's been awhile since I reviewed any wines from Cupcake Vineyards. The last one was their Red Velvet wine (follow the link for the review), which I found "oddly alluring and pleasantly drinkable." And that's no joke. Even though it's a silly name and concept, the Red Velvet wine is a guilty pleasure of mine. I'm man enough to admit it. But now, we have the Cupcake Cabernet Sauvignon. Cabernet Sauvignon, of course, being one of the big red wine varieties. Who drinks red wine and doesn't enjoy a nice Cabernet? 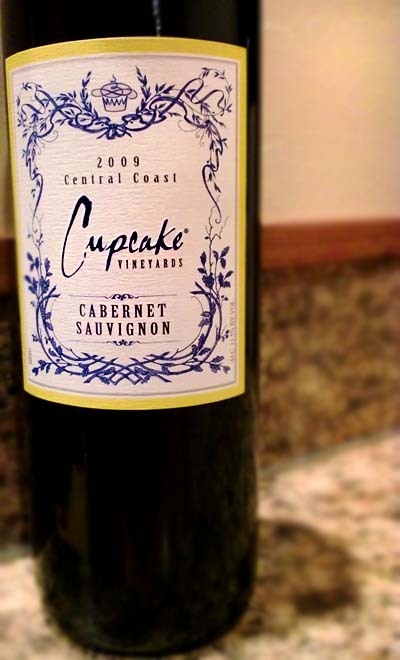 The 2009 Cupcake Vineyards Cabernet Sauvignon pours a dark ruby color and has aromas of cherries and currants. It tastes like (surprise!) juicy cherries, tart plums, and a hint of vague spice and mocha followed by a sweet, soft tannic finish. Make no mistake, it's a decent everyday type of Cabernet. A bit sweet, but hey, it's freaking Cupcake Vineyards. What do you expect?! Personally, I still prefer their Red Velvet over this. But hey, this isn't bad either. I look forward to tasting the 2010 vintage soon. Drink This: if you want a decent, sweet everyday type of Cabernet Sauvignon. Don't Drink This: if you're looking for a big, burly Cab.